The Santa Cruz Warriors, affiliate of the Golden State Warriors, are set to host the Reno Bighorns, affiliate of the Sacramento Kings, in Friday’s Twitch matchup (10 PM ET). To get you set for the contest, here is a breakdown of each team’s two-way players. The 2016 NBA G League Rookie of the Year and 2017 NBA G League All-Star Game MVP, Quinn Cook is currently on a two-way contract with the Golden State Warriors, playing for Santa Cruz at the G League level. Cook has had his opportunity with the NBA Warriors this season, playing in nine games, including his first career start — an eight point, three assist, three rebound game vs. the Charlotte Hornets. At the G League level, Cook has been one of the best in the league, averaging a fourth-best 25.5 points, to go with 8.1 assists, 5.5 rebounds and 1.3 steals in 11 games so far this season. Cook has scored 30 or more points on five occasions this year, including a season-best 35 points in the second game of the season. On Nov. 10, he came very close to a triple-double, notching 24 points, 10 rebounds and eight assists in the Warriors’ 111-82 victory over the Wisconsin Herd. Cooley, who was a Notre Dame star from 2009-13, is finding his fit in the Sacramento Kings organization. Cooley, who holds the NBA G League record of 29 rebounds, is averaging 15.3 points and 8.9 rebounds in 10 games with the Reno Bighorns this season. The 6-foot-10 forward is coming off a 28-point and 12-rebound performance against the Skyforce in the Bighorns’ first appearance on Twitch. Sampson joined Cooley as the Kings’ two-way players for the season. Sampson has spent most of his time in Reno, averaging 14 points and 7.1 rebounds in 11 games. Ironically enough, Sampson dropped his season high of 26 points in the last meeting with the Warriors, where he knocked down 71.4 percent of his shots and added a career-high 15 rebounds. The former Sixer and Nugget has also made an impact in Sacramento, playing in six Kings games and making two starts. Boucher has yet to play a professional game, as he’s been sidelined with an injury since the postseason during his senior year with the Oregon Ducks last season. 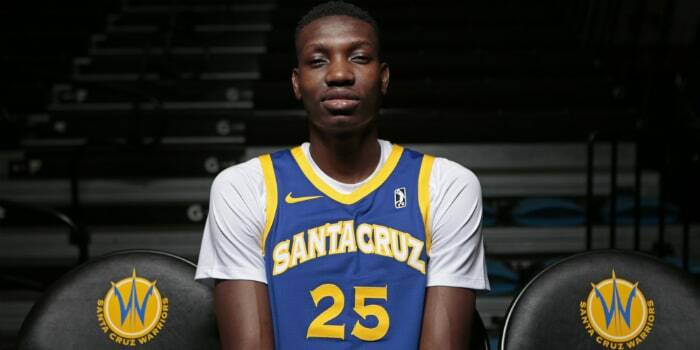 The Canadian-born big man has said he is planning on January 2018 for his return, and debut with the Santa Cruz Warriors. Boucher, who stands at 6-foot-10, averaged 12 points, 6.8 rebounds and 2.7 blocks in 69 games with the Oregon Ducks in the Pac-12.